Welcome to Hunting Games! We aim to collect the top free online hunting games here. Hunt virtually and rack up points! Here at HuntingGamesFree.org, the hunting season is always on! No more waiting for the perfect time of the year. No rules and regulations to mind. Pull out your rifle and fire away! YES, this site has all the hunting games you can handle! First, while playing these games and hunting down deers, ducks, and everything else in between, you learn hunting etiquette. You don't just have fun capturing those animals. You also learn how to hunt them the RIGHT way...without making them suffer. Second reason, well, you don't kill anything by playing hunting games on the internet! You can chase down and shoot rabbits, deers, etc. left, right, and center and you don't have to worried that animal activists and authorities might be breathing down your neck. Third reason, as I have mentioned earlier, at HuntingGamesFree.org, there are no close seasons! The hunting season is always on no matter what time of the year. Right here on the site, we offer a lot of the free online hunting games that drive gamers like you gaga! From relaxed classic remakes like Duck Hunt Remake, which is pretty much like its console version and elder brother. The primary objective of the game? 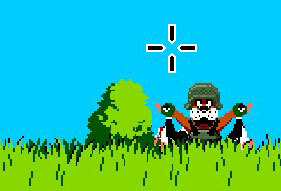 Score as MUCH as you can by shooting ducks - black or red. If you want to go berserk, you can even shoot down those tree branches for BIGGER and BETTER scores. And don't forget, you are not alone in this. You have your tried and tested hunting dog with you! To fast paced finger-cramping hunting games like Bunny Bounty where the hungry bunnies have stepped into your territory. It's time to make a stand before they decimate your farm and steal your crops! Mind you, these bunnies are mean and they come in waves so you better get that rifle and fingers ready! And games where anything goes like Hog Hunter where you can just go ahead and shoot everyone and everything in sight! Do that and you get MORE rewards and more points. It doesn't get more fun and action packed than this! So what are you waiting for? Check out the free hunting games at HuntingGamesFree.org and have fun!